The Environment Agency Exemplar Award is presented annually to recognise outstanding health, safety and environmental performance in the delivery of its projects. A maximum of one award is made in any year and, if no projects are deemed to have performed in an exemplar manner, no award is given. The 2015 award has been presented to Team Van Oord’s Broomhill Sands Coastal Defence Scheme as a result of the excellent health, safety and environmental behaviours and performance exhibited during the course of the project, and the proactive approach to managing the general public on a busy tourist and recreational beach. 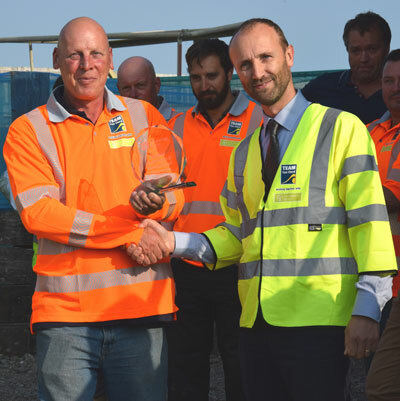 The trophy was presented to the site team, represented by Team Van Oord’s Steve Towell, by Paul Mustow, the Environment Agency’s Deputy Director for Capital Delivery. This is the second time in the past three years the Environment Agency Exemplar Award has gone to a Team Van Oord scheme. In 2013 it was awarded to the £18m Steart Peninsular project adjacent to the Severn Estuary. The project comprised the construction of a major wetland habitat area and associated flood defences, as part of the Environment Agency’s overall environmental offset scheme for other estuary works. When complete, the Broomhill Sands Coastal Defence Scheme at Camber in East Sussex will provide improved protection from the risk of flooding for 1,831 properties, 825 of which are residential. The works to improve the standard of sea defence with a wave wall and rock revetment are expected to reduce the flood risk from around 20% to 0.5% probability in any one year – equivalent to improving the risk from one in five years to one in 200 years, including allowances for climate change and changes in predicted tide levels. The scheme includes: improving a 700m length of shingle beach by recharging the existing beach; removing the existing timber groynes and constructing eight new 54m groynes to stabilise the beach and retain the beach material; and constructing a 1,700m length of rock revetment and wave wall along the remainder of the frontage. The works commenced in August 2014 and are scheduled for completion in December 2015.